This page stores old arguments. Please see instead current more reasonable version. 建議行政院 Ideas for the Executive Yuan: 地名每層採漢語拼音 Hanyu Pinyin for all levels of place names: Taipei => Taibei, Kaohsiung => Gaoxiong. link:2008.10. It is even more important to get rid of the rule that cities and counties' names still use old (Wade-Giles, etc.) Pinyin (whilst towns, villages and roads use Hanyu Pinyin) upon the eve of the large amount of new addresses generated by the unification of Taiwan's cities and counties. 今比當初開始開會更亂： I remember when we first had those meetings back in 1999 to clean up the wretched "bastardized" (p=b=p etc.) Wade-Giles system for place names here in Taiwan. So now we still have it after all, mixed up even more, with Hanyu Pinyin. Why can't we just have Hanyu Pinyin? 反正若政府要宣示什麼， 要全國一次的。電腦的人要一次改程式。 不要一區一個日期， 另一區另一個日期。 Whatever the government announces, it should be only once, for the whole country. Don't set different dates for different areas. Programmers can't stand it. Taipei -> Taibei, Kaohsiung -> Gaoxiong. 同學們， 您的名字會不會拼？ Johnny, do you know how to spell your name? 推漢語拼音， 摧╱廢通用拼音 Go Hanyu Pinyin, no Tongyong Pinyin. 希望有市場機制遏制類似事情再度發生。 I wish market forces would prevent similar incidents from happening again. 反正， 阻礙人類溝通之技倆遲早必輸。 Anyways, schemes to interfere with human communication will fail in the end. 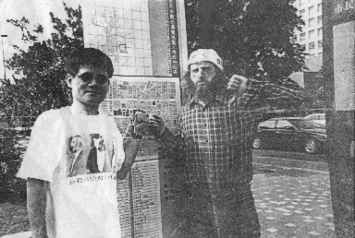 Photo: Me and "Tongyong Pinyin" perpetrator Yu Boquan, 1998. We are both thumbs up over the spelling of his "ShiFu Rd." sign. But wait: now he wants to climb back up and add an "h" but mayor Ma won't let him. note. 感謝馬英九聽見我們「外籍人士」的話， 不像李應元。 Thanks Taibei mayor Ma for listening to we "foreigners", unlike his 2002 opponent Li Yingyuan. 我們外國人為了學中文花很多時間， 把漢語拼音背得很熟， 正如大家背１２３阿拉伯數字， 也用了很多年， 而突然來了個小丑及小丑政府， 來開玩笑， 玩遊戲， 要把我們好不容易背起來的系統， 弄一個假的， 似是而非。 干擾到腦部深層。 如同重定紅綠燈意義。 We foreigners, to learn Chinese, spend countless hours memorizing Hanyu Pinyin, just like one has memorized numerals 123..., and use it for many years. When along comes a clown and clown government, to crack jokes and play games. Taking the system that we spent so much time ingraining into our brains, and making a phony look alike, disorganizing the deep layers of the brain, like as if they redefined the meaning of red/green traffic lights. You see, the those in charge (of the federal government) here in Taiwan have a hard time accepting the Hanyu Pinyin Chinese romanization system for bilingual street signs, because that system reminds them of China perhaps. Therefore they must add their "value added services", Tongyong Pinyin, which amounts to mangling a few letters of Hanyu Pinyin. 圖： １９９８年那天余伯泉請我到新光大樓。 Photo: that day in 1998 when Yu Boquan invited me to Xinguang Tower. 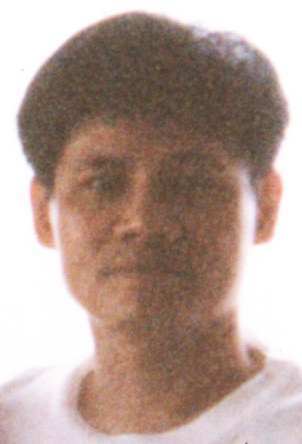 不知道他此臉仍要不要： 余伯泉放大 Enlargement of Yu Boquan， 可供懸賞照之用 suitable for most wanted posters. Q: 至於「通用」主謀怎會跟您一同照相， 莫非您也是幫兇之一？ What were you doing taking snapshots with the "Tongyong" mastermind, might you be one of his co-conspirators? A: 那天為第一次見面， 他約我來請我加入他的跟隨者， 但教唆不了我。 That was our first meeting. He tried to get me to become one of his followers. What about finally using "2004" etc. instead of "ROC 93" year names? Why doesn't the Taiwan government fix that first? 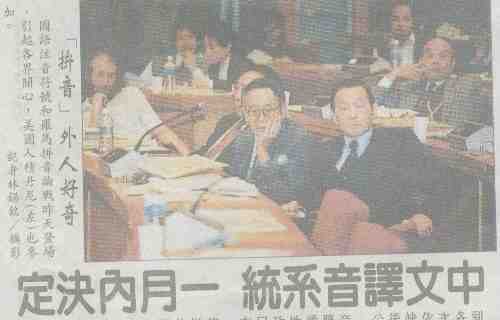 2003.6 They wanted to lynch Dr. Yu. 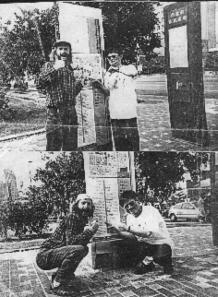 2003.1.25 嘉義兩字的英文譯名拼音混亂， 縣市政府下周一連繫會報將提案統一為「Ｃｈｉａｙｉ」 City and county will be called "Chiayi"
笨蛋， Ｊｉａｙｉ才不必遲早再改， 恰亦其跛腳通用拼音「法」。 Bzzzt. Guess again, fools. It's right there on your Tongyong chart too. 主要我想說是通用拼音是反對愛情， 反對人類， 不用愛做出發點。 是把反對目前中國政府， 那股好的努力， 反而倒過來向民眾， 向我們漢語拼音使用者為難， 造成連支持台獨的我， 希望再一次政黨輪替。 Mainly I'm saying that Tongyong Pinyin is anti-love, anti-human. They are taking a good idea: saying no to the current government of China, and mistakenly turning it against the people: we Hanyu Pinyin users, causing even supporters of Taiwan Independence like me, to wish for another switch of ruling parties. 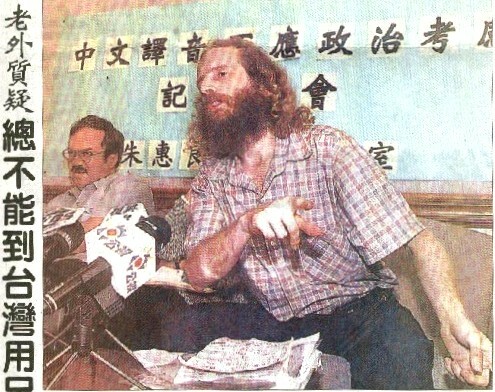 這是因為在他們狹窄經驗中民族、 護照、 語言必須有關聯， 故納粹醫師似的製造一種殘忍的語言學。 This is because in their narrow experience, ethnic groups, passports, and language, all must be connected. So like Nazi doctors they create a cruel twisted form of linguistics. 我門「外國人」來台之前都花了很多時間背漢語拼音， 知道嗎？ Guess what, we "foreigners" spent lots of time memorizing Hanyu Pinyin before coming to Taiwan. Like when Yu Boquan first started hanging street signs in 1998, I told him that the same phonetic initial should not have both the letters C and Q assigned to it, otherwise real linguists would laugh. Although he didn't agree to it on the spot, all I know is that he went back and sure enough before long he did what I said. Mainly I reminded Yu over and over about the need for systemization of the phonetic initials, or else he was going to get laughed out of the place even earlier. I told him don't have Hanyu Pinyin's JQX sometimes represented by JQX, sometimes by ZCS, and best of all would be a return to pure Hanyu Pinyin. Well, sure enough not long after I told him that he indeed drove JQX out of his scheme, using instead ZCS to represent both Hanyu Pinyin's ZCS and JQX. Later he apparently realized that this was going overboard, and let J back in. Unfortunately I don't have enough energy to track in just what state poor J lies in today. After being released from the "shadows of Q and X", Yu et al. were now free to use their "worried about the comfort of foreigners facing unfamiliar letters" slogans. One thing I didn't influence was Jh, as it appeared after I stopped talking to Yu. However, it does reflect the systemization I so emphasized with him earlier. I also told him about beng peng meng feng vs. bong pong mong fong. I said pick one set or the other, don't mix and match. Apparently he never took this advice of mine. By the way, Yu's pre-1998 stuff I didn't influence, as I hadn't met him by then. Indeed, I don't think he appeared on the "pinyin scene" here in Taiwan much earlier. If what you say is true, then you've made it possible for a lot of key players to be able to stomach Tongyong. Well, if they stomach it now they can stomach anything anyway. T-Pinyin: 台灣式漢語拼音 Hanyu Pinyin Taiwan style. Tongyong Pinyin: we foreigners' point of view: Were the ones who use pinyin, not them. Imagine if someone ordered that the meanings of the numbers "7" and "8" be swapped, and for no good reason. It would be painful to have to get used to their new meanings. [Chinese:]Paper 台灣的路牌應該用漢語拼音： 從非語言學面談起 (Taiwan's road signs should use Hanyu Pinyin: non-linguistic aspects)。 文中亦提到注音符號、 簡體字。 Bopomofo and simplified characters are mentioned. http://www.romanization.com/ and http://www.pinyin.info/ are on my side. ２０００．１２．３０我特別去第六屆世界華語文教學研討會， 為了讓他（余伯泉）難看， 結果， 老師們已經在笑他；我想我不必再追蹤他， 反正已經蠻無聊， 部長處理就好。 I am so bored of this. I think I will "get a life" and let the minister take care of the battle. 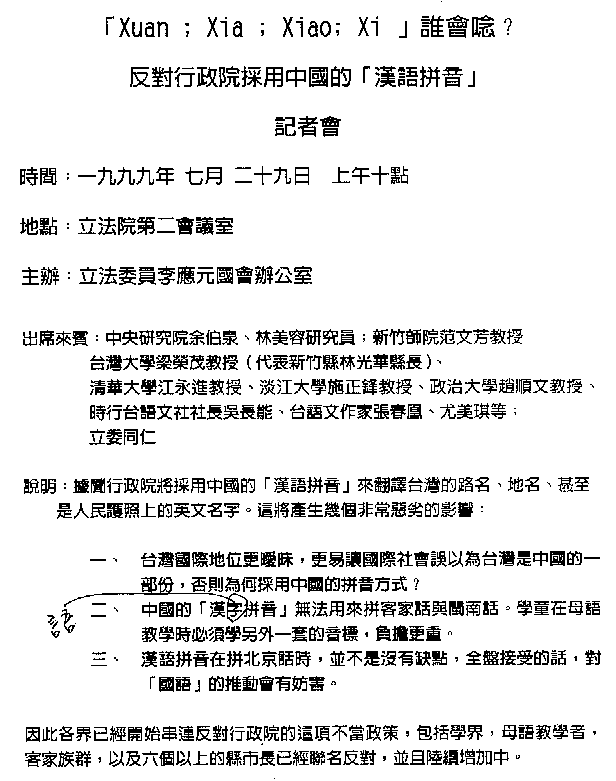 Tsai's paper probably already added: "despite this version of Tongyong Pinyin's claims of only 15% syllabic incompatibility with Hanyu Pinyin; as an example of the trouble caused when even one letter[字母] poisons a whole word [詞], the miracle kid, Dan Jacobson [積丹尼] has said in the newspapers (indeed almost every paper carried his claim that day 2000.10.30 evening..., lucky, as Yu's later bitchings were forced out of the papers by other bigger events) that Taibei city, of 632 street names, if the city chooses Hanyu, they need to change 197 streets' signs, if they chose Tongyong, they need to change 193... but wait, aren't they already using Tongyong? Yes! even for an 'upgrade' from the Tongyong of 2 years ago to today's, one needs to change that many streets' signs: proof that Tongyong isn't stable: the author no matter if it is 'showtime' already or not, has the bad habit of continually revising his junk. Later on as usual, following Jacobson's quick back of the envelope breakthrough calculations, the team of Qiu Yaochu & Xu Hezhong did a more detailed calculation, although there will (hopefully, as I hope the silly Tongyong phenomenon can be finally towed to the junk yard) never be again such a golden opportunity to have all newspapers carry their results..
另外為什麼不提漢語拼音的“ｃａｎ”？（因為也是余案的）。 那麼我們可以說， 余先生今天的方案的任何部分， 有可能晚上就放棄， 第二天甚至於請立委們提他開記者會為了堅決反對。 然後有一些熱心的支持者跟著他， 真丟臉， 最丟臉的是有一兩位有語言學訓練的人也跟著他。 總而言之， 他甚至比我更差勁！ Photo: 與余伯泉合照， 台北 1998.7.18 with Yu Boquan, Taibei. 另張 Other photos. 一些積丹尼的寶貴看法也丟入此 Even more of Dan Jacobson's valuable opinions are tossed into this 垃圾桶檔 junk pile file. Will Pinyin take hold? China News 1999.4.5, by me. I happen to browse your home page. I think it is impolite to spell Dr. 余伯泉[Yu Boquan]'s name in Han-Yu Ping-In. 2003/7: 余名片Ｂｏ又長了個ｒ。 I notice Bo on Yu's name card has grown an "r". 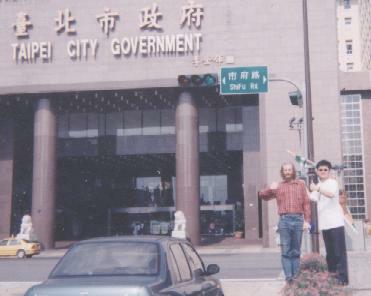 1999.4.6 於中央圖書館， 台北。 at National Central Library, Taibei. 聯合報 United Daily News 自左： 積丹尼、 陸以正大使、 王天昌教授、 張孝裕教授， 最右： 李鍌主委。 From left: Dan Jacobson, Ambassador Lu Yizheng, Prof. Wang Tianchang, Prof. Zhang Xiaoyu; rightmost: Chairman Li Xian. 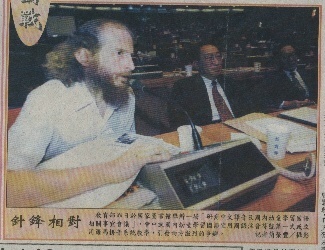 台灣日報 Taiwan Daily News 自左： 積丹尼、 陸以正大使、 王天昌教授。 From left: Dan Jacobson, Ambassador Lu Yizheng, Prof. Wang Tianchang. 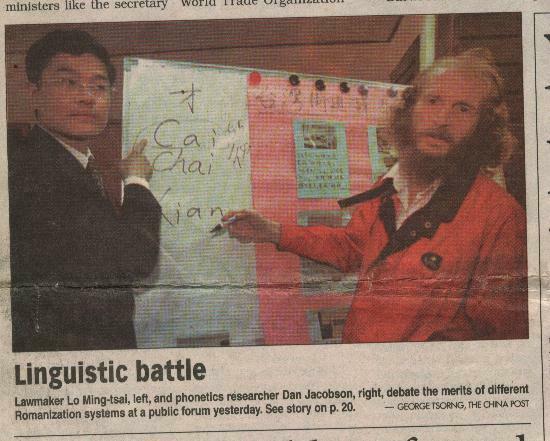 我２００１年的態度是： 閩、 隨便他拼， 只給我漢語拼音路牌。 My 2001 attitude: let them spell Taiwanese and Hakka however they choose, just give me Hanyu Pinyin road signs. From Dylan Sung 11/2000: I guess you've not seen mainland publications of Hakka dictionaries, because there are already schemes for romanising Meixian (Moiyen) dialect. If you are able, you might like to acquire a copy of Zhang WeiGeng's "Kejiahua Cidian", 1995, from Guangdong Renmin Chubanshe. Its romanisation was created as early as 1960. In fact, Hainanhua, Chaozhou and Guangzhouhua were also romanised at around the same time. It is mentioned in Hashimoto's The Hakka Dialect. Dan says: I have Hashimotos's book. I have seen various schemes to adopt hanyu pinyin to the 'dialects', a nasty looking one is that fat dictionary from Xiamen Univ. for Minnanyu. So I too tried my hand at it with the result being my 1997 paper. However, this is not an active area I'm fighting about anymore, as of course the key out of trouble here in Taiwan is getting hanyu pinyin in place on the road signs. As far as the 'dialects' are concerned, I'll let the professors fight it out amongst themselves. Indeed, their envisioned target: school kids, don't really pay attention to romanization clues in their one hour per week 'mother tongues' classes. Po-Feng Yang 11/30/00 > What I am interested is your view on mu3 yu3 jiao1 xue2 and all the phonics systems out there. That would be great if you can elaborate on these topics. "Amazing" Chinese-English "coincidences" that I "discovered"
不但此枚， 還有三分之一的他自己當年掛的路牌又要改， 如這張要加個ｈ： ＳｈｉｈＦｕＲｄ．否則太像中共什麼的。 Not only this sign, Yu wants to change 1/3 of the versions he originally hung, e.g. this one he wants to add an "h": ShihFu Rd. otherwise it is too like China or something. Wasn't it Shih in the original Wade scheme? Back to where we started, no? P.S. : regarding the words on the building. We'll get that changed to "Taibei" one day too. There also is a fine point: the capitalization of the second character's romanization: the Fu in Shifu. Shifu is probably more wear-resistant than ShiFu, but I was thumbs up anyway, as at least this sign of his could be considered Hanyu Pinyin. [If you pass "ShiFu" through a chain of 10 people like in those games, it is most likely to become "Shifu", so, if we start with "Shifu", we don't have to worry about data loss. It's the same philosophy behind why we don't put tone marks or IPA on street signs, it is striking a balance, we want the information reproducible in even say, Morse code transmission circumstances. Yes, when I first thought about the problem I felt real bad about the loss of information involved [ShiFu->Shifu], but, gotta strike a balance.] The U.S. Post Office uses all capital letters. 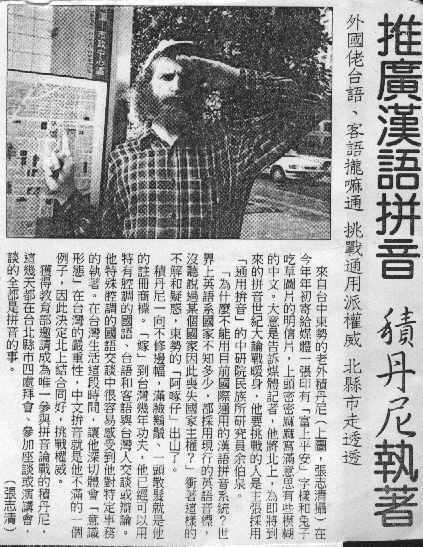 Taiwan News newspaper 2001/08/01 editorial was "We proudly choose Tongyong Pinyin". 余伯泉及跟隨者２０００年已到國語推行委員會就職， 帶領我們到空前路牌不安的時代。 其中江文瑜教授常說「若用通用拼音可免鍵盤打漢語拼音Ｑ字對左小指之傷」。 圖： 右小指仍受打 Ｅｎｔｅｒ 鍵之苦， 怎辦？The Tongyong team promises relief from Hanyu Pinyin's Q damage to typists' left pinky, but doesn't the right pinky still have to hit Enter? 使人想起 Reminds one of 惡博士 Dr. Evil pinky habits. 經度是從倫敦算其， 我們美國人雖然從英國獨立， 仍用之。 語言文字又繼續用又仍叫英文， 拼法也不差多少。 Longitude is counted from London, but that doesn't bother us Americans. Though we declared independence from Britain, we still use and call the language English, and the spelling differences are minor. CPAN, mandarintools etc. sites have pinyin related software. 郵局 Post Office 中文路名英譯一覽表 translation table 還算正式嗎？ really official? The value of Hanyu Pinyin is in its large user base. Phonetic details aren't important anymore. If it is unfamiliar, then study it. Also one hopes Hanyu Pinyin will stay frozen and not change with the language. A fixed indexing system, like English. 台灣路牌換拼音頻繁， 乾脆用電子看板算了。 Taiwan street sign pinyin changes so often, might as well install reprogrammable eclectic sign boards.